Luck has run out on four members of a robbery gang who allegedly break shops in the Alaba International Market, Lagos State. PUNCH Metro learnt that the modus operandi of the syndicate was to destroy padlocks of their target shops by pouring acid on them. 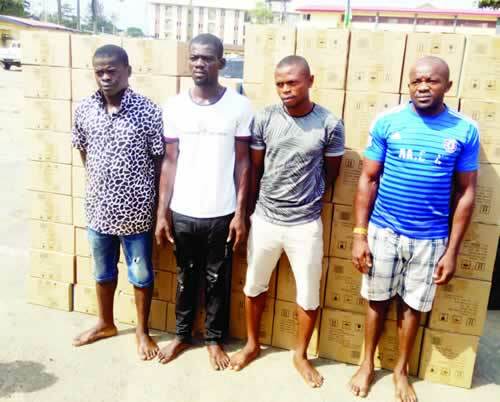 It was gathered that the suspects –Tochukwu Akorisa, Ndubuise Egwuatuonwu, Ifeanyi Eze and Aboi Rufus – had attacked a warehouse in the market, stealing 427 cartons of electric bulbs valued at N19.1m. The shop owner was said to have reported the incident to the police, leading to the arrest of one Tona Nwenyi, who allegedly bought some of the goods from the suspects. Our correspondent learnt that Nwenyi led the detectives attached to the Lagos State Commissioner of Police X-Squad to Akorisa, who reportedly coordinated the robbery operation. A detective told PUNCH Metro that Nwenyi was caught at the point of selling the stolen goods. “Akorisa subsequently led us to his accomplices. Two other persons, Tony Eme and Ejike Chinwoba, who bought the bulbs from the gang, had been arrested. “We have recovered about 100 cartons out of the 427 cartons they made away with, which is worth N19.1m,” the source said. Twenty-six-year-old Akorisa, confessed to the act, adding that he intended to use the proceeds of the robbery to give his ailing mother a medical attention. Egwuatuonwu explained that it was Akorisa, who facilitated the sales of the loot, adding that he was promised N250,000 from the deal. “But I have not got anything before the police arrested me,” he added. One of the receivers, Nwenyi, said he wanted to return the bulbs to Akorisa, having discovered they were stolen, when he was arrested. Eme said he bought 15 cartons of the bulbs. The Lagos State Police Public Relations Officer, SP Dolapo Badmos, said the command was on the trail of other fleeing suspects.